Scottsdale, AZ—Three global talents, Alessio Boschi of Australia, Erika Bertin of the United States, and Shar-Linn Liew of Thailand were the winners of the Centurion 2013 Emerging Designer Competition, sponsored by Stuller. 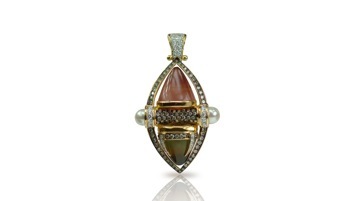 All three designers made their U.S. tradeshow debut at the Centurion Jewelry Show. 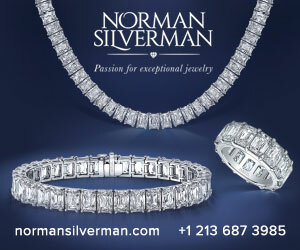 The competition, now in its fifth year, drew almost 70 entries from luxury jewelry designers around the world. More than 300 retailers voted to narrow the field down to 12 finalists; the Centurion Board of Retail Advisors voted again to select the three winners, each of whom received a free exhibition space at the Show. Italian-born, Australia-based Alessio Boschi was fascinated by jewelry even as a child. He graduated as a jewelry designer at the "Academy of Costume and Fashion" in Rome in 1994, and, at the age of 21, was already the winner of two international jewelry awards, the Charles Perroud award in Lyon, France and the Kobe Pearl Contest in Japan. After graduating, Boschi lived in Athens for three years and worked as designer for an emerging Greek company specializing in collections with semiprecious gems. He then moved back to Italy and worked as a freelance designer for major jewelry houses there. In 2003, he was named in the Guinness Book of Records for the design of the Millennium Sapphire, the biggest blue corundum ever engraved. He spent the following six years in Thailand working with a high-end manufacturer for Arab royal families. In 2006, he moved to Sydney, Australia, to become design and product development director for Autore, where his collections “Oceania,” “Ice and Fire,” and “Venezia” drew the attention of major international fashion magazines, and won a number of prestigious jewelry prizes around the world. In December 2010, he was invited as one of the emergent worldwide designers to participate in a major jewelry fair in Beijing, China. This was the debut of Alessio Boschi brand. 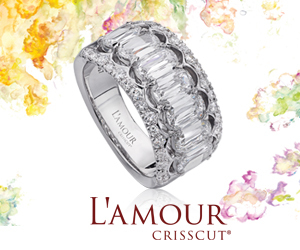 In March 2011, he founded the company Lux2Lux Jewels with business partner Martino Eduardo Convertino. Boschi emphasizes eco-friendly jewelry that is made with ethical, conflict-free stones. “Ivy” earrings by Alessio Boschi feature a detachable drop, left, while his “Palazzo” ring, right, was inspired by the Duke Palace in Venice, Italy. 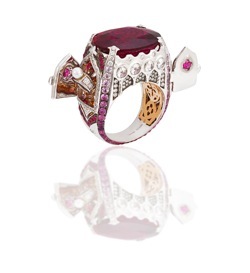 The ring features two secret doors that reveal a tiny ring in diamonds and a ruby-encrusted heart. 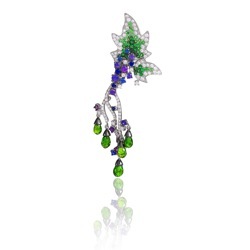 At top of page is the Ivy earring without the drop. Before she entered the jewelry industry in 1999, designer Erika Bertin of Alasia already had an established career in luxury brand building with Young and Rubicam Advertising Agency in London. She left Y&R to join the Italian fine jewelry firm Favero as director of sales and, while handling the sales department, learned about precious stones procurement and jewelry manufacturing. 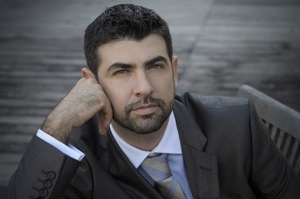 Bertin moved to New York in 2000 to set up Arte Italiana, the US branch of Favero, as a partner to the owner. Favero jewelry found a responsive audience in the Americas and saw healthy and successful growth, becoming a recognized brand. Many of the Favero pieces distributed in the USA were either designed or merchandised by Bertin. 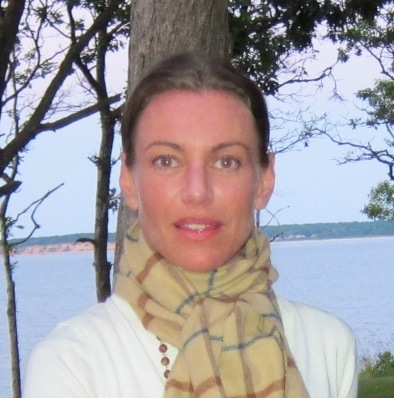 In 2008, Bertin set up the New York-based Peppermint Inc., as a consultant to European brands on American distribution, and to continue her own design efforts. Until 2011, the largest client was the Gucci Group, for whom she consulted in the distribution of fine jewelry for the wholesale channel, as well as fine jewelry design and merchandising worldwide, and staff training. Bertin returns to Centurion 2013 for the first time since her Favero days, with her own new line, Alasia. 100% manufactured in Italy, Alasia combines fashionable designs with materials such as oxidized silver and 10k gold, making it a creative newcomer in the affordable price bracket. She said, “Having been to the Centurion Show in my former role with Favero, I'm doubly excited to be exhibiting there under my own name. The jewelers who attend Centurion understand creativity, fashion, and design, and I'm very much looking forward to being able to show them a range of pieces that cover the affordable classic as well as fashionable luxury category. Thank you for voting me in and giving me this opportunity." 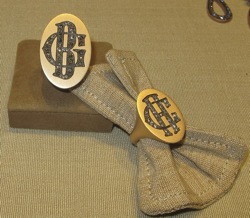 Left, Alasia’s yellow gold personalized cocktail rings with champagne diamond initials. 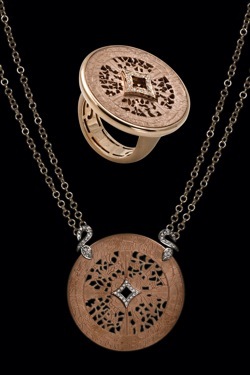 Right, rose gold medallion and ring were inspired by a medieval incense diffuser top, and come with handmade double gold chain and white diamonds. Shar-Linn Liew, Sharart Design, 125/8 Sawankhalog Road, Dusit, Bangkok 10300, Thail; (+66) 2243-2446; www.sharartdesign.com; contactus@sharartdesign.com. Jewelry designer Shar-Linn Liew grew up in Singapore and was exposed to designing since she was a young girl. Her mother, who used to be a clothes designer, fueled her passion in fashion and antiquity. Her greatest enjoyment was accompanying her mother on buying trip to Hong Kong – combing the fabric and accessories market. But it was her husband who exposed her to the world of gemstones and fine jewelry, although Liew’s first foray into jewelry actually happened in college. She had come to the United States to study finance, but during her studies created handmade jewelry that was sold at the Chazen Museum of Art at the University of Wisconsin in Madison, WI. Shar-Linn Liew of Sharart Design waering her articulated blue sapphire Shinto earrings. After college, Liew’s first job had more to do with financial statements than fine jewelry. With her husband’s encouragement, she enrolled as a student at GIA in Carlsbad, CA, where she specialized in the grading and identification of gemstones. After a two-year stint as a jewelry merchandiser at a TV jewelry network, Liew decided to focus on her own collection. Her pieces are entirely handcrafted by her husband's jewelry manufacturing house, which has more than 30 years of experience. The inspirations behind Sharart pieces are constantly evolving around the designer’s Asian heritage blended with old European allure. Be it the architectural lines of Asian pagodas or a mid-century Art Deco enameled vanity case, Liew crystallizes her inspiration to design something she considers art. Says Liew, “It is such an honor to receive this award from the Centurion Show and to be able to share my creations with retailers in the United States. I am so very grateful for this experience." Liew's Ying Yang rotating tourmaline pendant has a pink tourmaline dome (9.88 ct), a green tourmaline dome (8.30 ct), white diamond (0.40 ct), cognac diamond (1.05 ct), and freshwater pearls in 18K yellow gold.